An exciting announcement from OzGrav to be presented on the last day. The Physics Decadal Plan was launched in December 2012 at the Australian Academy of Sciences, and is due for a mid-term review. While nearly all of the original recommendations are still valid, the landscape has changed in some areas in the intervening five years, and one purpose of the mid-term review will be to identify new opportunities for physics in Australia as a result of these changes. The National Committee for Physics (NCP) of the Australian Academy of Sciences has been charged with conducting this review. The NCP wants your input! Fill out the survey here. Network and create key relationships with like-minded people from the global physics education sector. High Tea Workshop: “How to strengthen physics by making it inclusive” with Professor Chandralekha Singh. Limited Tickets. Professional development workshops: Three minds-on / hands-on workshop sessions to enhance learning experiences with your students. Panel session: Run in conjunction with Uni Physics Educators. Emeritus Professor Kurt Lambeck AO (Australian National University) has revealed how our planet changes shape—every second, every day, and over millennia. These changes influence sea levels, the movement of continents, and the orbits of satellites. For transforming our understanding of our living planet, Kurt Lambeck has received the $250,000 Prime Minister’s Prize for Science. Kurt’s original work in the 1960s enabled accurate planning of space missions. It led him to use the deformation of continents during the ice ages to study changes deep in the mantle of the planet. It also led to a better understanding of the impact of sea level changes on human civilization in the past, present and future. More information on the PM’s Prizes for Science can be found here. And you can find more details on how to nominate for next year’s Prime Minister’s Prizes here. The Royal Swedish Academy of Sciences has awarded the Nobel Prize in Physics this year in half to Arthur Ashkin (Bell Laboratories, USA), and in half to Gérard Mourou (École Polytechnique, France and University of Michigan, USA) and Donna Strickland (University of Waterloo, Canada). Arthur Ashkin was awarded the Prize for his invention of optical tweezers, capable of grabbing particles, atoms, and living cells with their laser beam ‘fingers’. This tool utilises the radiation pressure of light to move physical objects. His first major breakthrough came in 1987, where Ashkin was successful in capturing live bacteria without harm. Since then, optical tweezers are now widely used in biological sciences. Gérard Mourou and Donna Strickland were awarded their prize in recognition of their innovation towards the shortest and most intense laser pulses ever created. Strickland and Mourou’s technique, called chirped pulse amplification, CPA, became standard for subsequent high-intensity lasers. More information on the Nobel Prize in Physics can be found here. The Australian of the Year Awards have recognised 89-year-old mathematician Alison Harcourt as 2019 Victorian Senior Australian of the Year. Alison completed her masters and undergraduate studies in Mathematics and Physics in 1950 from the University of Melbourne. She later went on to a position at the London School of Economics, before returning to Melbourne to take up a position at the Department of Statistics (later named the Australian Bureau of Statistics). During her time at ABS, Alison was instrumental in developing statistical methods pivotal in the creation of the Henderson Poverty Line (HPL), a method still widely used to measure poverty nationally. Alison also appeared before the Commonwealth Joint Select Committee on Electoral Reform in 1983, proposing a new method for listing political parties on ballot papers, which was instated federally in 1991, and remains in effect to this day. More information on the Australian of the Year Awards can be found here. Liam Hall (University of Melbourne) has been awarded the 2018 Veski Innovation Fellowship to further his research in applying quantum sensing techniques to chemical reactions. His work so far has focused on the response of nitrogen-vacancy (NV) centres of quantum mechanical defects in diamonds. Early stages of this research have been previously published by Dr Hall’s research group in Nature Communications. Further development of these quantum imaging techniques may lead to more efficient and accurate diagnosis of illness at a molecular level, as well as finding application in advanced manufacturing and synthetic chemistry. For more details on the 2018 Veski Innovations Fellowships, click here. Join the Royal Australian Chemical Institute to take part in Stories from the Periodic Table—a project that will showcase the personal connections people have to science. 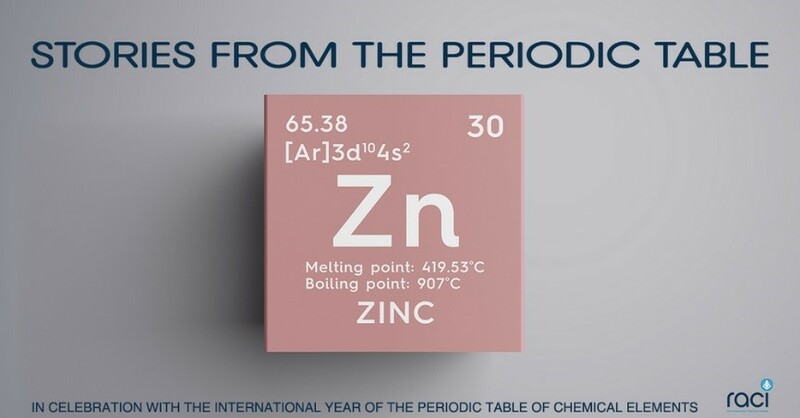 Over the course of the International Year of the Periodic Table in 2019, the RACI will publish your stories online to highlight the personal connections that people have to science, and to chemistry. Whether it’s from your work, studies or just everyday life, the Royal Australian Chemical Institute (RACI) wants to hear of your personal connection to an element. Is there an element you love above all others, or one that you hate? Do you have a medical story associated with an element? Can you connect an important event in your life to an element? Submissions will be accepted in text (up to 500 words) or video (up to four minutes), and should be sent to communications@raci.org.au. The first round of submissions closes on 15 December 2018. For more information on submissions and criteria, click here. The grant round for National Science Week 2019 is about to close. The total amount available is $500,000 and grant applications can be for $2000 to $20,000. August 2019), or in the week immediately before or after. Applications are open until 5.00pm AEDT (Canberra daylight saving time), Tuesday 20 November. More information, guidelines and the online application form can be found here. Professor Andrew Peele has demonstrated leadership in the evolution of the Australian Synchrotron, translating research benefits to society, and is an influential voice for science. As Director of the Synchrotron, he has been a driving force stabilising an uncertain funding future, garnering recognition of the impact of the facility in delivering science with real-life benefits, and cementing a major capital expansion for new beamlines. Underpinned by research achievements that created the foundation for new synchrotron-based imaging methods and leadership of initiatives to translate synchrotron research into industry benefits, Professor Peele has used his public profile as the president of the Australian Institute of Physics to contribute to the community by emphasising the impact and importance of science to society. Read more about Professor Peele and the Academy’s other new Fellows. Nominations are still open for a female scientist to head the AIP Women in Physics Lecture Tour as the WIP Lecturer for 2019. The tour celebrates the contribution of women to advances in physics and aims to increase public awareness of the possibilities offered by continuing to study physics. is available in 2019 to visit Canberra and all Australian State Capital cities and surrounding regions. The successful candidate will present school lectures, public lectures and research colloquia in venues arranged by each participating branch of the WIP. Travel and accommodation will be provided. Does that sound like you or someone you know? Find out more and nominate here. Call for nominations closes 14 Dec 2018. 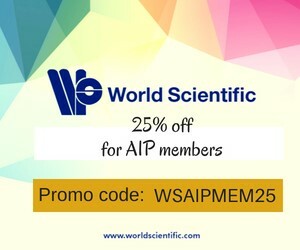 In case you missed it in last month’s bulletin, AIP members can now enjoy 25 per cent off World Scientific books by entering the promo code ‘WSAIPMEM25’ at checkout. World Scientific Publishing is a leading international independent publisher of books and journals for the scholarly, research and professional communities. If you are interested in reviewing any of these books for publication in Australian Physics, please contact the Australian Physics editors Peter Kappen and David Hoxley at aip_editor@aip.org.au. Reach a bigger audience. The Australian physics events calendar is the definitive source for physics events around the country. If your physics event isn’t listed here, ask us about adding it, having it included in these regular bulletins and tweeted from the AusPhysics account. Alternatively, feel free to submit your event to the AIP calendar for members to access. If colleagues would like to receive these bulletins, they can subscribe here. They don’t need to be a member of the AIP. You are being sent this bulletin as a member of the AIP.